Overgate Hospice Choir is proud to be presenting Karl Jenkins’ moving work in 2018 – the one hundredth anniversary of the end of World War One. ‘The Armed Man: A Mass for Peace’ is a powerful and compelling account of the consequences of war and the world’s hope for peace. Commissioned for the millennium by The Royal Armouries and dedicated to the victims of the Kosovo crisis, this work is a contemporary example of a mass based on the 15th century French song L’homme armé (The Armed Man). Set within the framework of the Christian mass, The Armed Man, uses both sacred and secular texts. The choir will be joined by the Youth Orchestra of Musica Kirklees (was Kirklees Music School) and their Music Director Thom Meredith. The choir will also be joined by three treble soloist from the Halifax Minster Choir; Rosie Barber, Martha Hill and Madison Tasker. 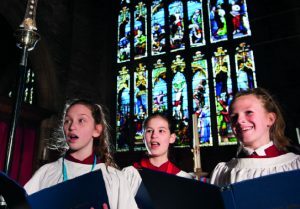 The concert will also feature choral items relating to the theme of war – more details to follow.